The Marshall DSL40CR 40-Watt Valve Guitar Amplifier Combo is an almighty combo that delivers stage-ready power alongside a highly versatile tone shaping for ultimate control. The DSL40CR boasts built-in digital reverb, effects loop, MIDI compatibility, and a wide range of footswitchable parameters that make is perfect for the gigging professional. The DSL40CR bears the Marshall name with pride and elevates that coveted status of the Dual Super Lead to greater heights. Packed with an impressive all-valve setup with three ECC83s in the pre-amp, and a single ECC83 alongside a pair of EL34s in the power amp, the DSL40CR has a high-powered engine to crank out the jams. For times when 40-Watts is more than you need, Marshall have included a power reduction switch that drops the output to a more manageable 20-Watts. Therefore, you can still overdrive the amps without resorting to deafening volume levels. Taking signal control even further, there is a 3.5mm jack output that allows you to practise in silence via headphones or take a direct recording output with studio cabinet emulation crafted by the genius crew at Softube. The DSL40CR is equipped with two channels that include the Classic Gain channel offering old school JCM800 tones, and an Ultra-Gain that cranks up with heat. The Classic Gain channel has a Clean/Crunch button that allows you switch between transparent clean tones or a nice crunchy overdrive. The Ultra-Gain channel is equipped with an OD1/OD2 button, which takes you from an open, high gain overdrive to a mid-boosted tone with greater high gain potential. The beautiful gold control panel is home to a wide-ranging EQ section, which offers the classic three-band Bass/Middle/Treble knobs that allow you to shape each bandwidth precisely. The corresponding Tone Shift button reconfigures the pre-amp mid frequencies when activated, which is perfect for easily performing a mid-range scoop that so many metallers love. The DSL40CR benefits from Presence and Resonance controls, which allow you to attenuate the higher and lower frequency content of your tone independently of the EQ. The Emulated-Out jack provides a line level output for headphones or connecting to a mixer. The emulated output has been designed using Softube-designed studio cab emulation. You can rest assured that your headphone/recording signal offers the utmost fidelity for practise or recording. The DSL40CR also offers a MIDI input for those who like to incorporate MIDI equipment into their live rig. The Marshall DSL40CR Combo is equipped with a Celestion V-Type speaker, which is specially designed to combine old and new in stunning fashion. The sweetly balanced output is delivered with aplomb, ensuring that cleans sparkle beautifully, whilst your high-gain, overdriven tones are delivered with a ferocious blast. 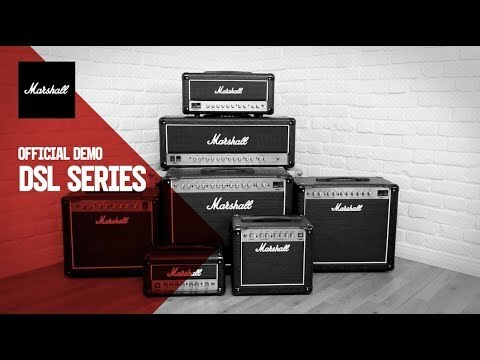 The Marshall DSL40CR 40-Watt Valve Guitar Amplifier Combo adheres to the classic black and gold Marshall design we've all come to know and love. The solid enclosure is covered in hardwearing black tolex and black corner braces. The gold front panel is stands out alongside the brilliant white Marshall logo.